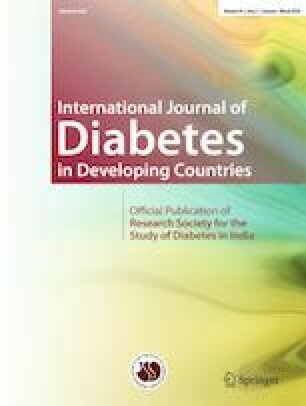 This exploratory study reports the prevalence of lipohypertrophy (LH) in insulin-treated type 2 diabetes patients attending a private tertiary hospital in Mumbai, India, and explores the factors associated with this condition. A total of 96 patients attending the outpatient department, completed an interviewer-administered questionnaire followed by an examination of insulin injection sites for the presence of LH by a trained diabetes nurse educator. Nearly 68% of the respondents had LH. Most patients (82%) had LH on at least two injection sites, with the frontal areas of the right and left side of the abdomen being the most common sites. Despite a high prevalence of LH, the majority of patients were unaware that they had the condition (77%) and could not identify the causes (74%). Half of the patients reported awareness about the different sites for injecting insulin, injection techniques, and the need for rotating injection sites. Only 26% always rotated injection sites, while 16% changed needles more than half of the time in the week prior to the interview. Bivariate analysis found higher number of years with diabetes and on insulin and a higher insulin dose per day as significant factors (p value < 0.05). Logistic regression showed a strong relationship between the presence of LH and the number of years on insulin (p value < 0.05). The number of years on insulin for patients with and without LH averaged 8.2 and 3.7, respectively. Findings highlight a gap in patients’ knowledge and management of LH, and call for a hospital-wide intervention encompassing patient education and provider sensitization. We also thank the management of Dr. L.H. Hiranandani Hospital, Powai for permission to conduct the study and the doctors, nurses, and research staff for their support in the data collection process in the inpatient wards. Thanks also go to Shirlly Koshy for data management. Most importantly, we are grateful to the patients who freely gave their time and inputs. This article does not contain any studies with human participants or animals performed by any of the authors. The study was approved by the Ethics Committee of Dr. L.H. Hiranandani Hospital, Mumbai.